Vacherin cheese fondue recipe for 4 persons. Choose a mixture of well aged vacherin AOP cheese. 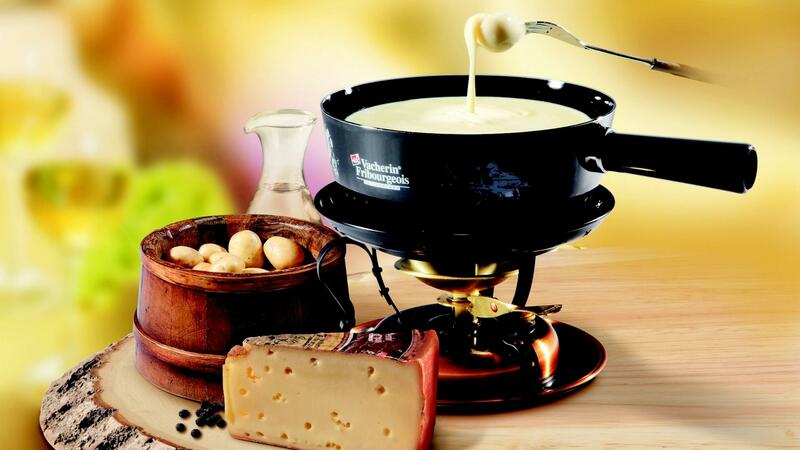 Use of quality vacherin cheese is the key to a successful Vacherin Cheese Fondue. Heat the water in an iron pot. Add Vacherin Fribourgeois AOP cheese and melt slowly. Be sure to stir constantly. Add lukewarm water if necessary. The cheese should become oily, creamy, and even a bit sticky and agreably warm. The Vacherin Fondue is served in a chafing dish. Important: keep temperature of chafing low. Cheese is not to boil again. Fondue is served with bread or with unpeeled potatoes.